If you’re like me, you’ve had your share of killing time waiting in a doctor’s reception room. Sometimes however, there are magazines to read that don’t date back to the Nixon era and from which I can glean some good recipes. 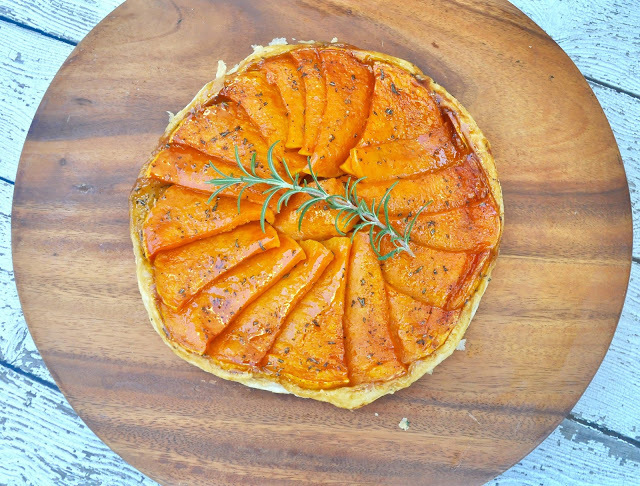 Since butternut squash is one of my favorite vegetables, and the season is upon us, this twist on the classic tarte tatin made with butternut squash, rather than the traditional apples, caught my eye while I waited for my name to be called during a recent appointment. It starts out with roasting half moons of butternut squash, seasoned with herbs, salt and pepper. The roasted squash is delicious as is, just out of the oven as a side dish, but this recipe, with a hint of honey, transforms it into something special. 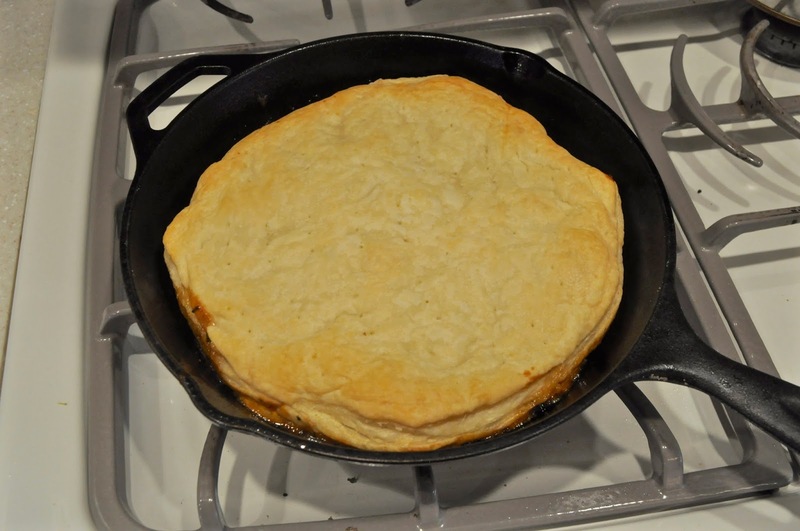 Layer the slices in an oven-proof skillet (cast iron is best), overlapping the edges slightly. 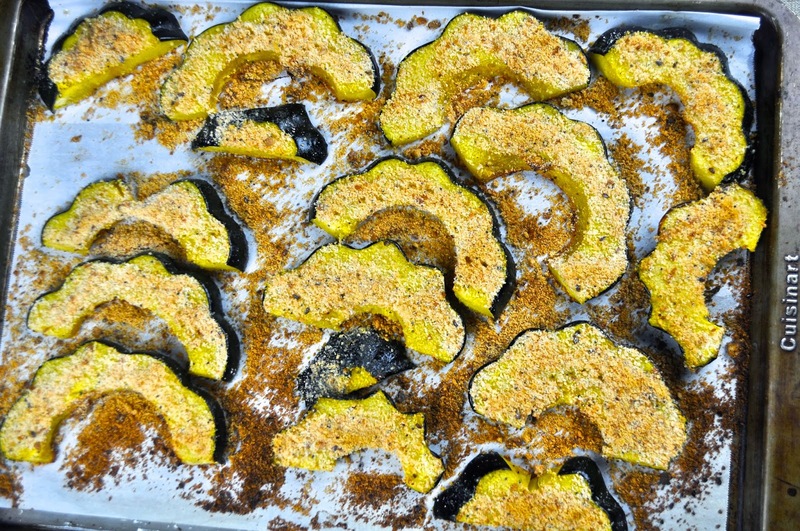 Fill in the center with another piece of squash. 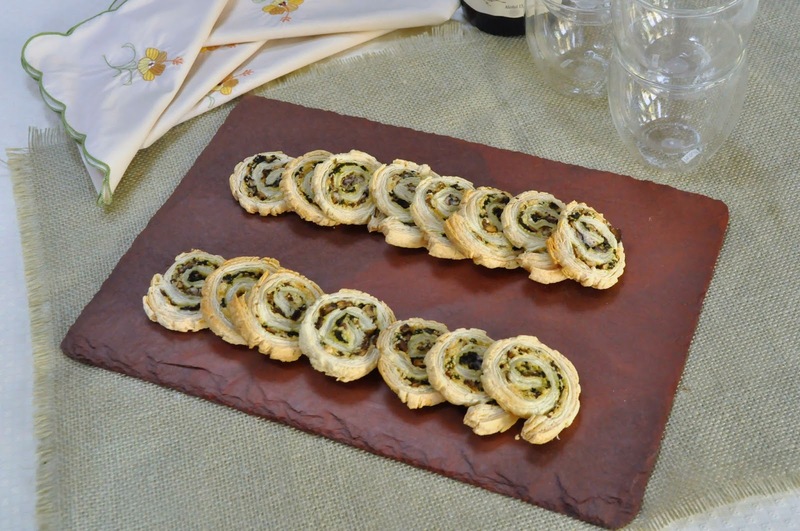 Place a piece of puff pastry on top, and pierce holes into it with a fork. Bake in the oven until golden,then carefully flip onto a plate. 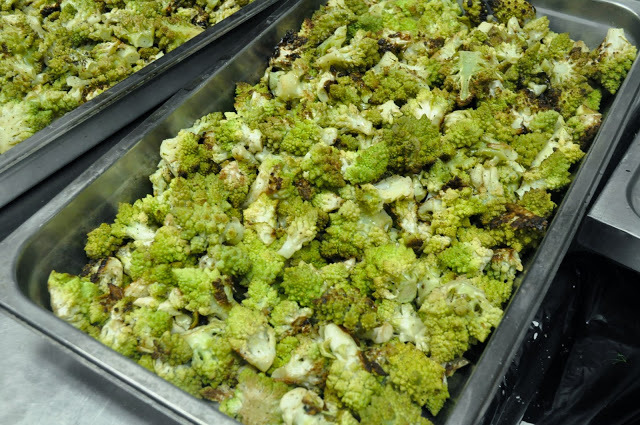 It’s a side dish fit for your Thanksgiving meal – or your family’s everyday dinner table. 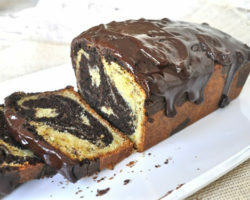 Now if only I could find a recipe this good each time I’m sitting in the doctor’s reception room, I might not complain about that last one hour wait! -Preheat the oven to 400 degree. 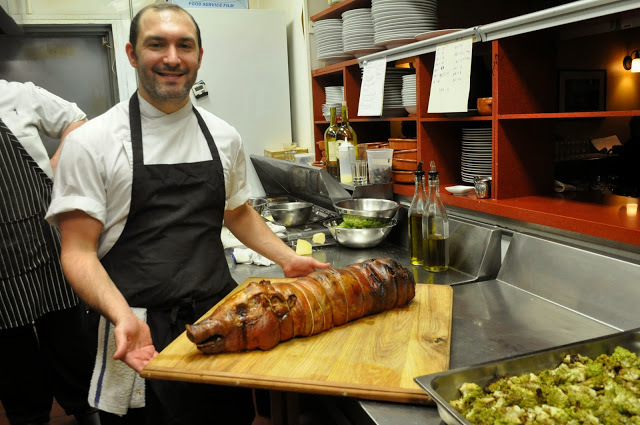 Line a half-sheet pan with parchment. 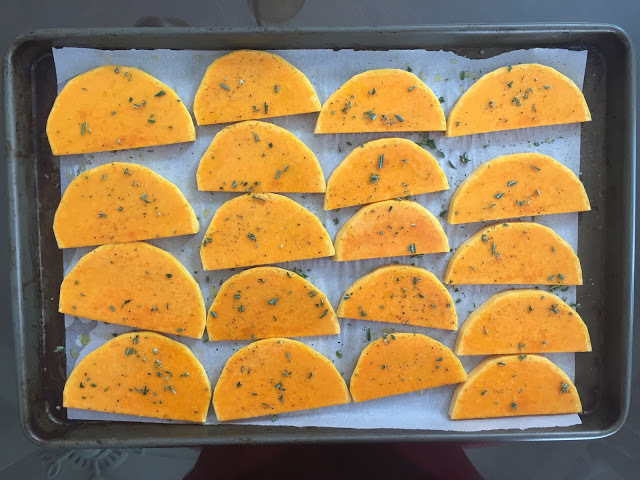 On the prepared pan, toss squash with oil, a pinch of salt, and about 3/4 of the rosemary. 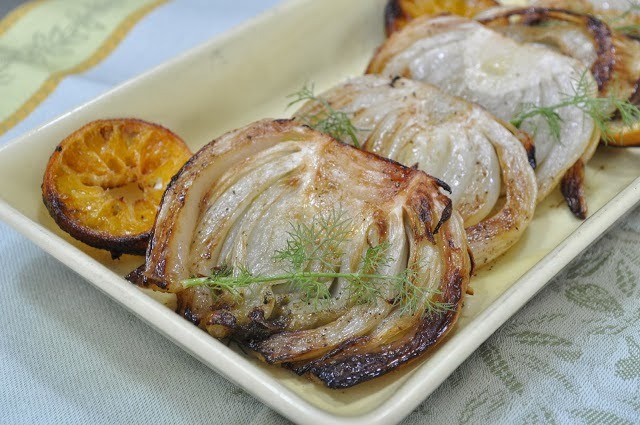 Spread in an even layer and roast until browned and tender, about 25 minutes. 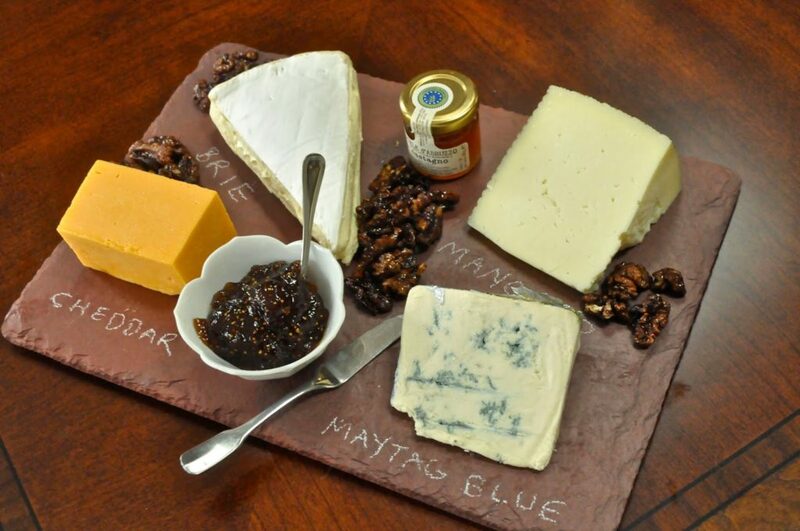 Let cool slightly on a plate. 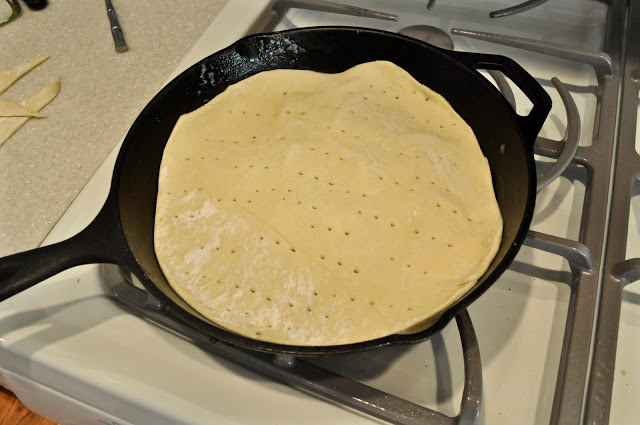 -Meanwhile, cut the pastry into a round the same size as the top of a 9 to 10-inch cast iron skillet. 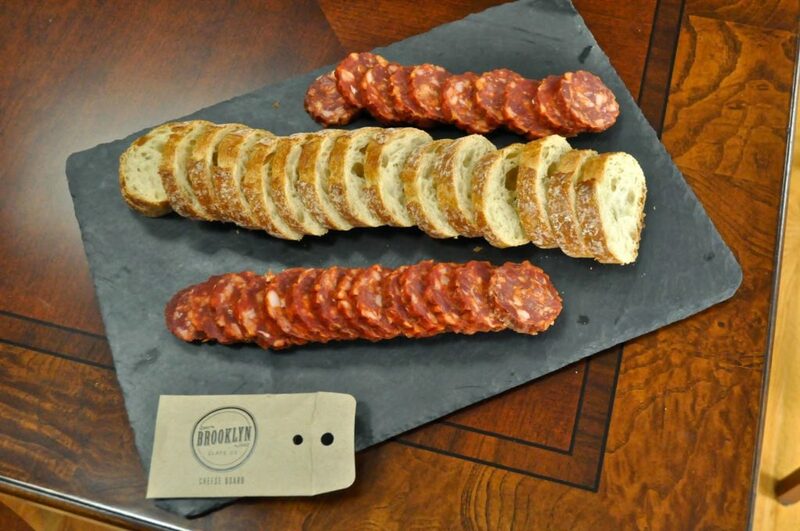 Place on parchment paper and refrigerate. -Melt butter in the cast iron skillet over medium heat. Stir in lemon zest and juice, honey and remaining rosemary. Remove from heat and when squash is done, drizzle most of it over the squash, leaving a thick layer in the bottom of the skillet. 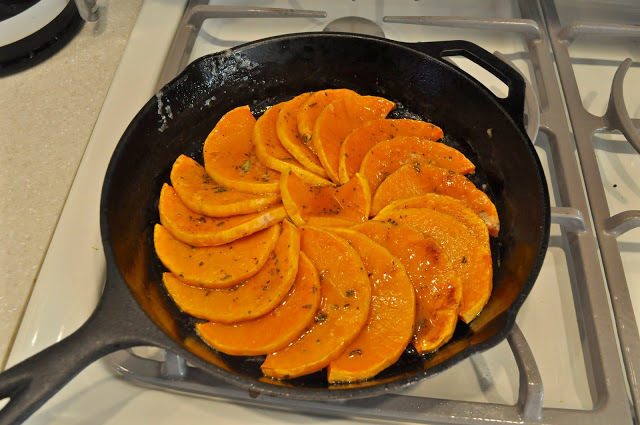 -Arrange squash in concentric circle in the skillet over the remaining butter mixture. Scrape any juices from the plate into the skillet. 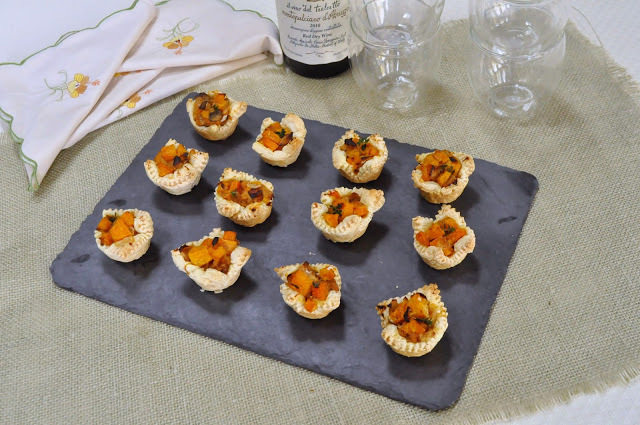 Place the pastry over the squash, and prick with a fork all around. 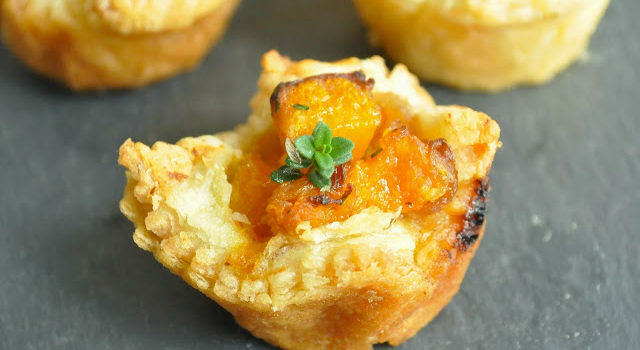 -Bake until the crust is golden brown, about 35 minutes. Let pan cool on a wire rack for 10 minutes. (I omitted this step because I was impatient.) Wearing oven mitts, center a serving dish over the skillet and carefully flip both together, then lift the skillet off the taste. Garnish with rosemary, if desired. 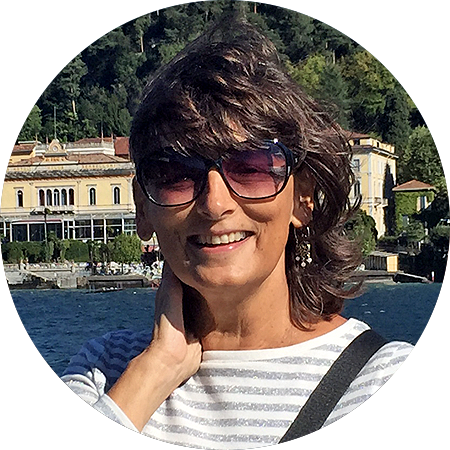 Although Italian food is my food of choice, and my cookbook shelves are lined predominantly with books from authors like Marcella Hazan, Lidia Bastianich and Domenica Marchetti, I am also a big fan of other types of cuisine – including Middle Eastern. Cookbooks from Yotam Ottenlenghi and Sami Tamimi also feature predominantly on my shelves for their flavor combinations that are so distant, yet so wonderful, from what I grew up eating. When I asked for the recipe, I was told it was from Ottolenghi’s book, Jerusalem, one of my favorite cookbooks, and one that was sitting on my bookshelf all along. I’ve since made it several times, with a slight variation. Instead of using the pine nuts called for in the original recipe, I used hazelnuts – a less expensive alternative to the costly pine nuts from the Mediterranean (for those of us who won’t buy Chinese pine nuts for various reasons – see here). 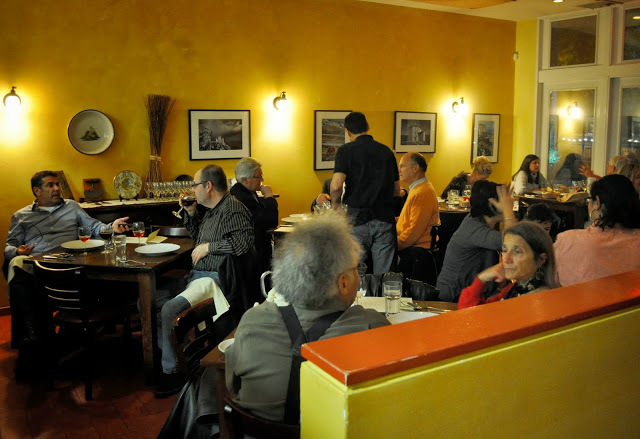 Gustiamo.com sells wonderful pine nuts from Tuscany, but fair warning – they don’t come cheap. 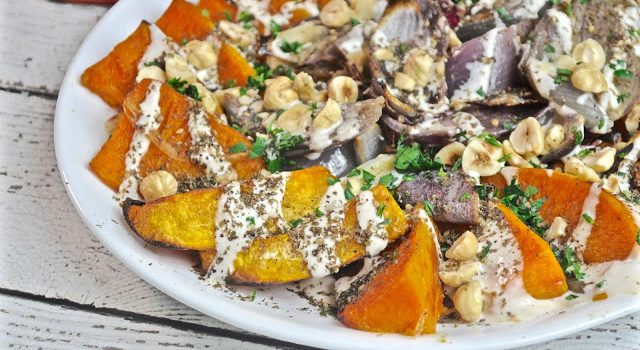 The sweetness of the onions and squash is hard to resist after they’ve emerged from the oven, but wait until you drizzle the sauce, the nuts and herbs all over it to get the full effect. Zatar, a middle Eastern herb blend, features predominately at the end. I can find it locally at a shop in my town called Savory Spice, or at Williams Sonoma, but they’ll also sell by mail order. 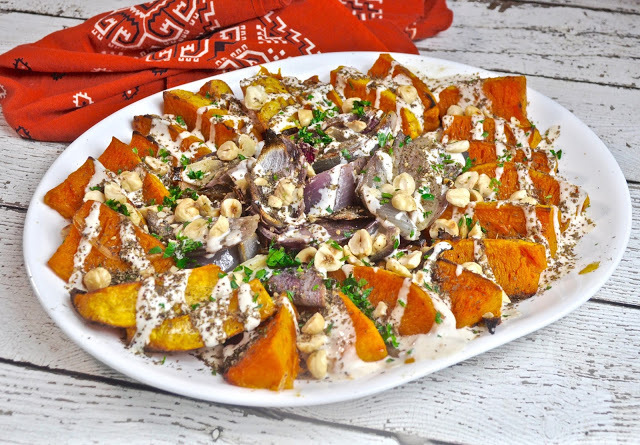 The first time I made this dish, the tahini in the sauce was overwhelming to my palate, so I toned it down by adding some yogurt. In fact, I made it subsequently using only Greek yogurt and lemon juice, giving the sauce a nice tang. 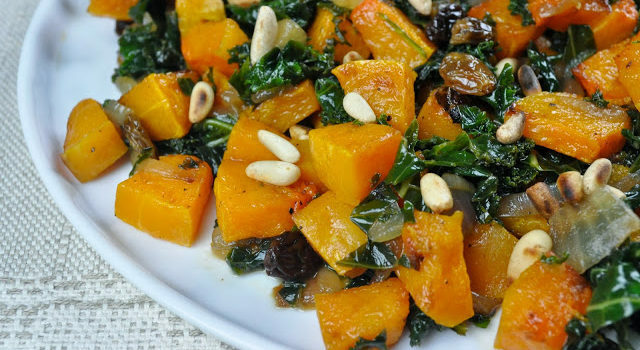 It may well become your go-to vegetable dish for holidays or dinner parties. 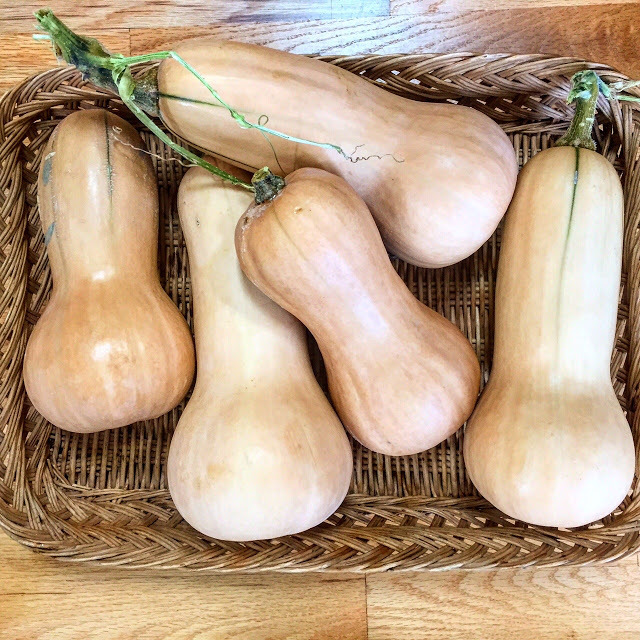 There’s nothing like the intense flavor of summer vegetables – juicy, red tomatoes, crunchy, sweet Jersey corn and more … but when autumn comes, I’m in love all over again with squash. 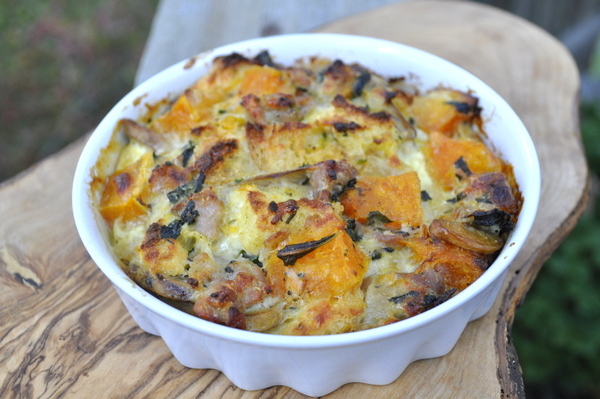 This fall, I came back from Europe to a plethora of ripe butternut squash in the garden. They were used for roasting, for soups and before they were all gone, for this pasta dish that I saw on my friend Stacey’s blog, originally from Cooking Light magazine. 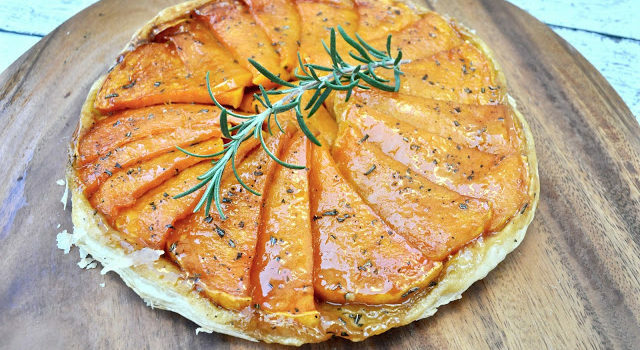 If you’ve got vegetarians sharing the table at Thanksgiving, you could eliminate the bacon, and they’d never miss the turkey if you present this dish. The only problem is that the vegetarians will be fighting off the rest of the meat eaters who want a second helping of this mac n’ cheese. 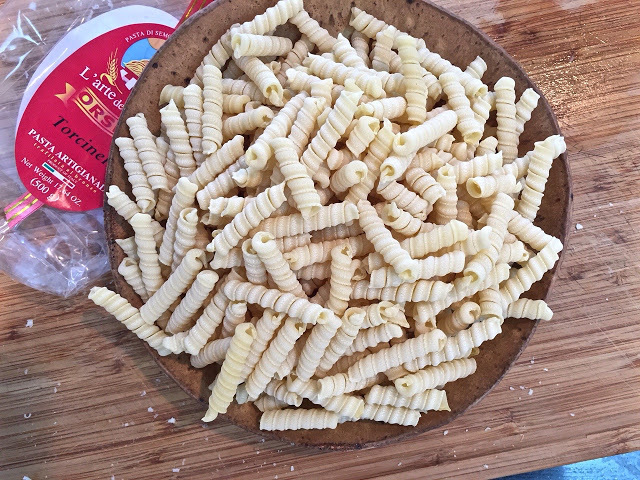 Instead of the traditional elbow macaroni, I wanted something a little more festive, so I used torcinelli, from an artisanal pasta maker, found at a local Italian grocery store. 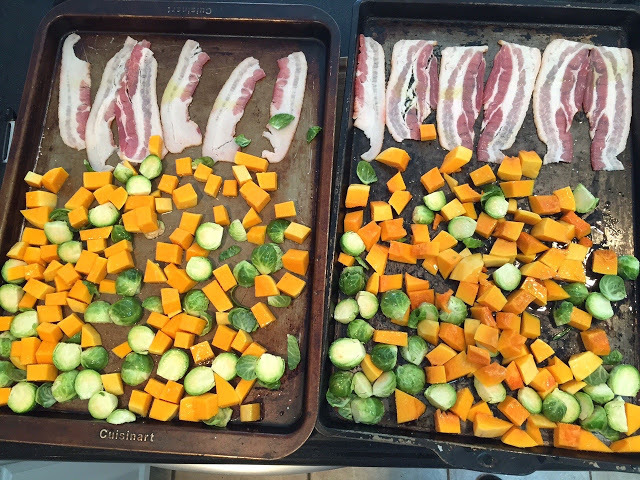 The vegetables and the bacon were roasted together. I used another pan to roast the onions and mushrooms that were cut in half. 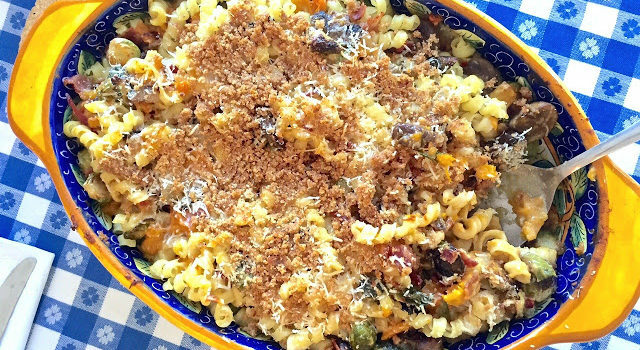 Make the sauce while the pasta is cooking, then mix everything together, sprinkle with breadcrumbs and parmesan cheese and pop it in the oven. If the bacon is crispy before the vegetables are tender, remove from the pan first. 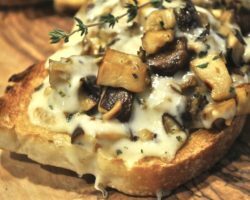 On another pan, lay out the red onion slices and the 3 large unpeeled garlic cloves and the halved mushrooms. Drizzle w/ some olive oil and place the in the oven for about 15-20 minutes. 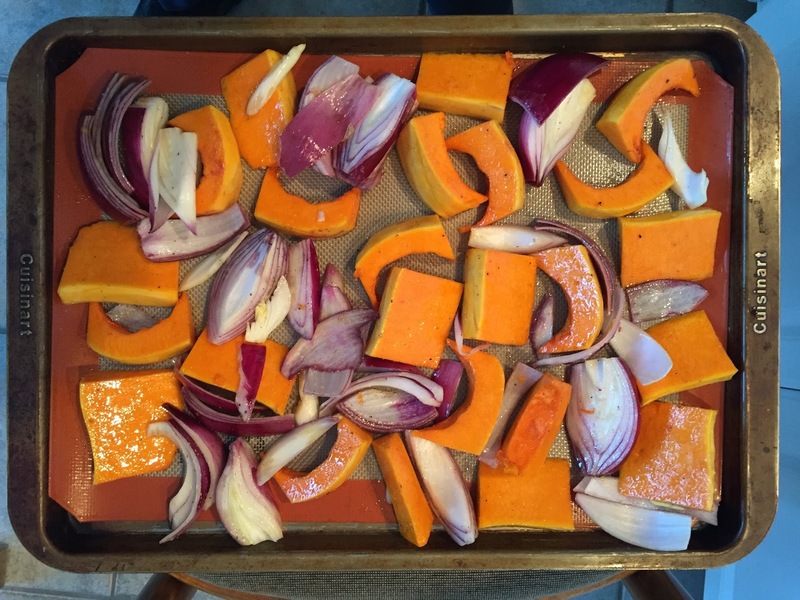 Using an 8″ x 10″ casserole pan, lay out the sprouts and cooked squash. 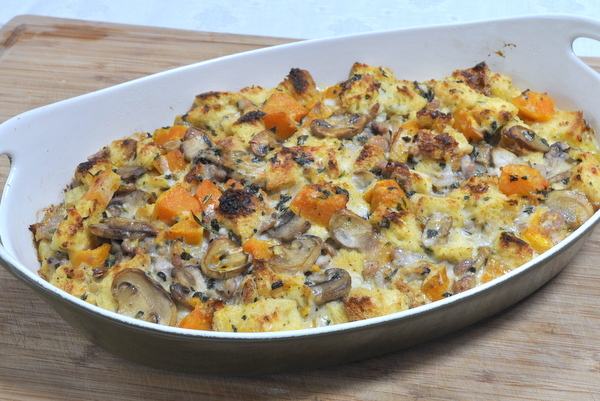 Using a fork or potato masher, mash down on the squash cubes to create a puree or mash. I like to leave some texture so I didn’t make it a really smooth puree. Add in the cooked onions, mushrooms and bacon pieces. 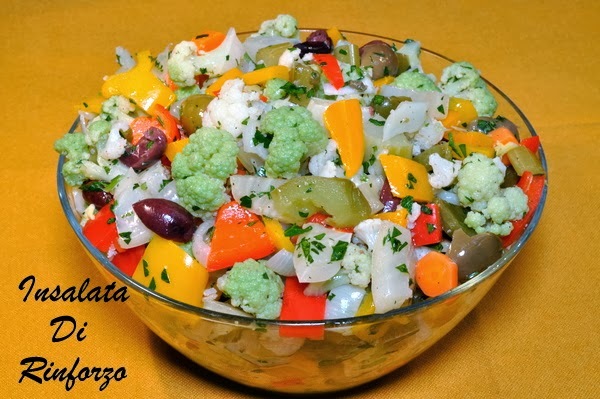 Mix the vegetables together in the baking dish. Reduce to a simmer and whisk until it is a nice even consistency, only a few minutes. It won’t be really thick, but don’t worry, once it’s in the casserole, the other ingredients will absorb the sauce and thicken it. Season the sauce with a pinch of salt, black pepper and hot pepper flakes. When the pasta is done, drain and add to the casserole pan with the vegetables. Mix together. 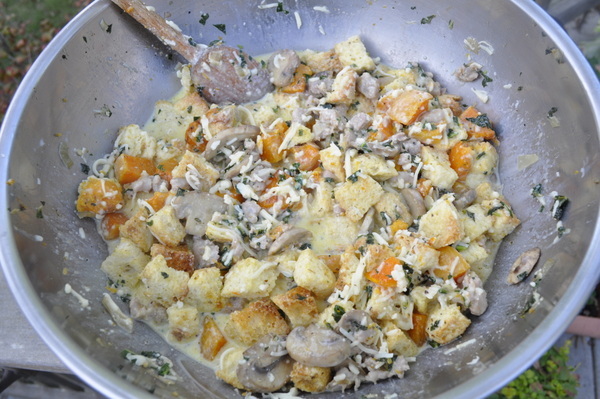 Melt the 2 T. butter and mix in the bread crumbs and parmesan cheese. Sprinkle on top of the casserole. Place casserole back into the oven for 20 more minutes, until everything is blended and melted and bread crumbs are browned. Garnish with sage leaves, if desired. 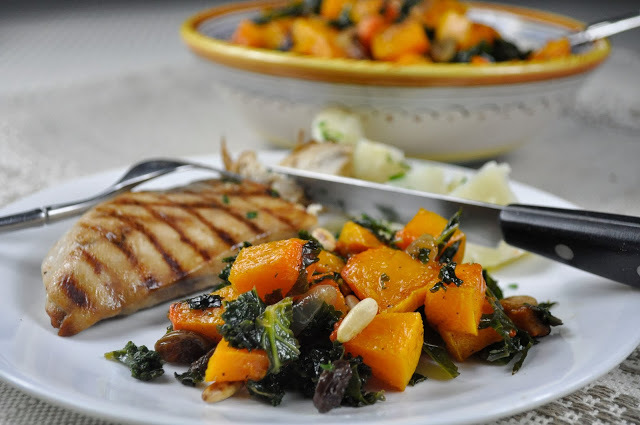 If you haven’t already noticed from all the butternut squash recipes I’ve posted lately, it’s one of my favorite vegetables – winter or summer. 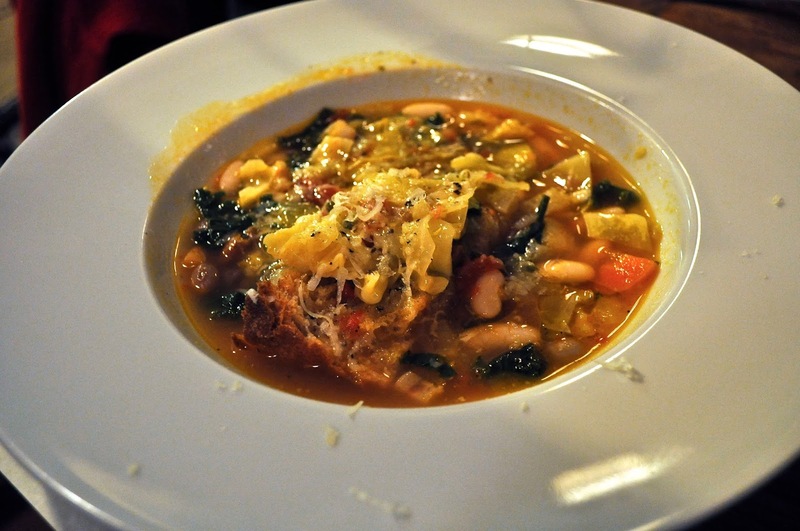 It makes a great soup, filling for lasagna, or even a delicious base for ice cream. 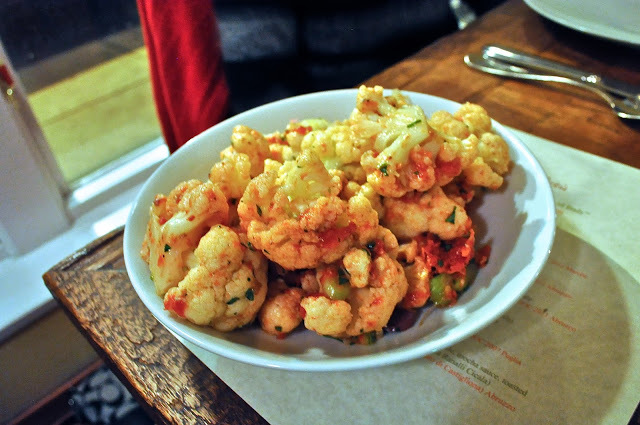 It’s also wonderful just as a vegetable side dish, as pictured here. 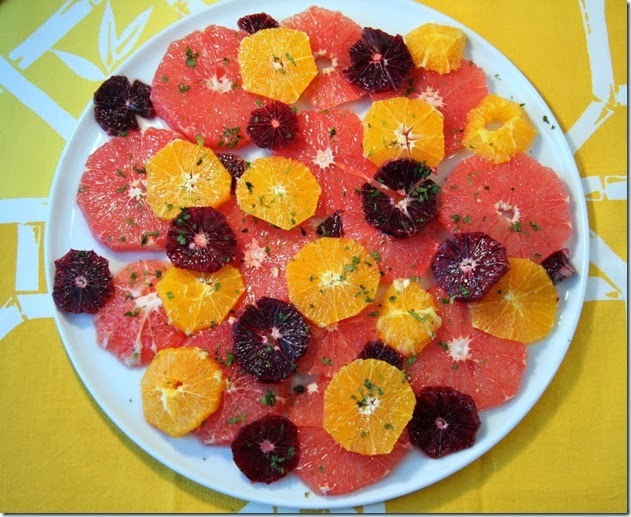 My friend Dede made this dish a while ago for a luncheon of our Italian chit-chat group, and I wanted to eat the whole plateful. But I played nice and left some for others. Then I went home and made more just for me. I used kale in my version, since that’s what I had at home, but I much prefer it with swiss chard or spinach, as Dede made it. You could even add some chick peas or cannellini beans to make this a vegetarian dish with complete proteins, or serve it as a side dish with a piece of grilled meat, as I did. 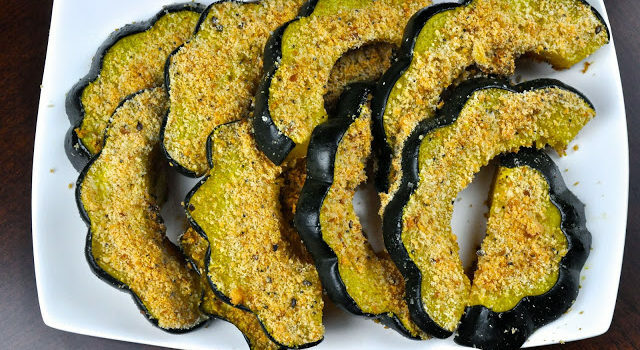 Note: Dede cooked her squash in a skillet, but I tossed the pieces with olive oil and roasted them in a 400 degree oven for 30 minutes. 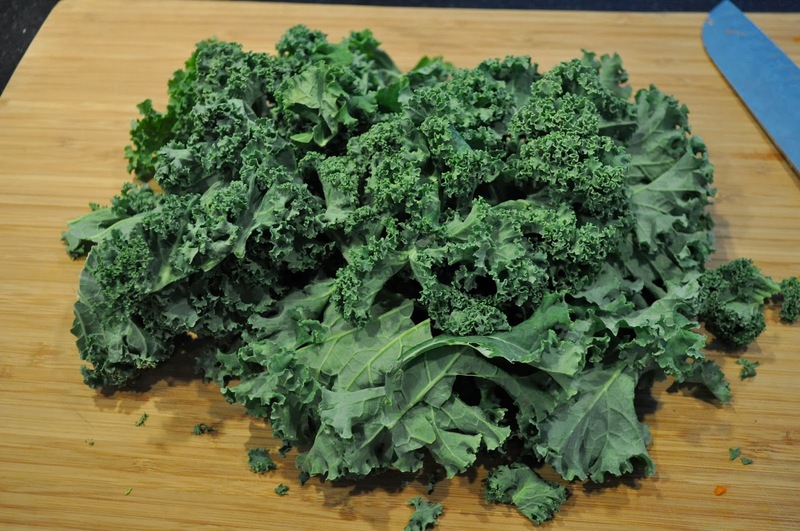 Add spinach or other greens until wilted. Have you got any half-full bottles of prosecco or champagne left over from New Year’s festivities? OK, don’t scoff — there are some of us who don’t quaff down a whole bottle in one sitting. In addition to the leftover prosecco, there were a dozen chestnuts and a small hunk of butternut squash in the fridge still uncooked and in search of a recipe. 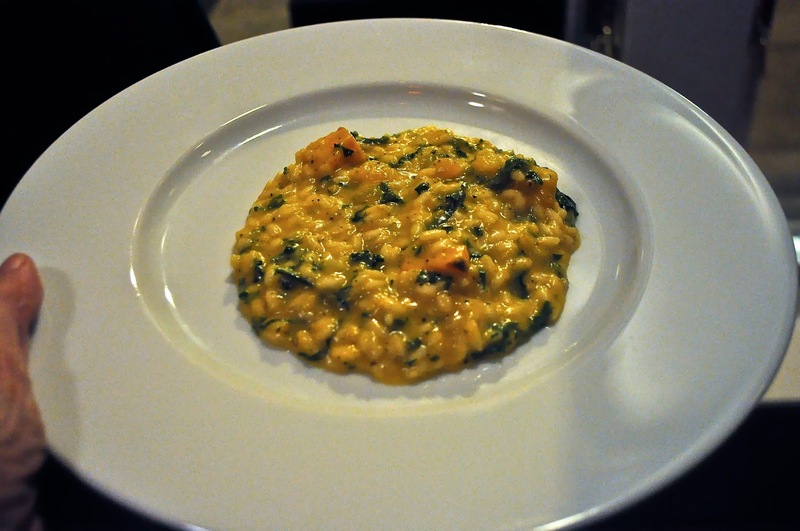 Hence the amalgam of these ingredients and birth of this risotto dish. 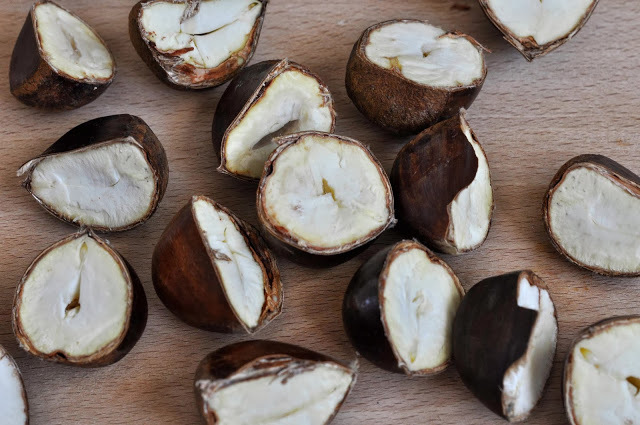 You can also use already-peeled chestnuts from France that come in a glass jar, but since I had these fresh ones, I cut them in half and plunked them into a pot of boiling water – not long enough to cook them through, but long enough to loosen the shell and pry out the interior. Click here for a more thorough explanation of how to do it. After cooking the risotto in this copper pot, I may never make risotto again in any other vessel. 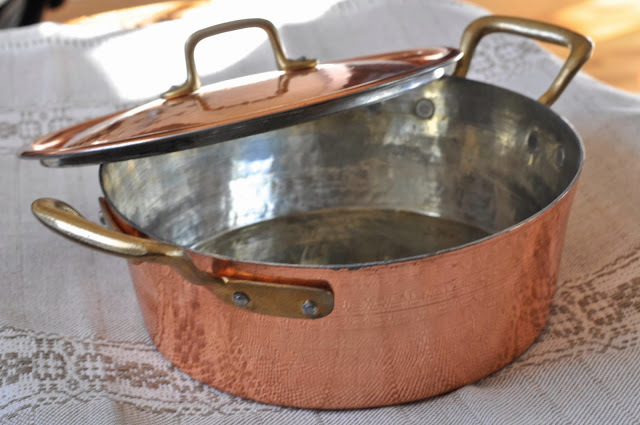 The heavy-gauge pan ensures really even cooking without any hot spots. And it’s beautiful to look at as well. Make sure you have all the necessary ingredients at the ready before starting to cook. 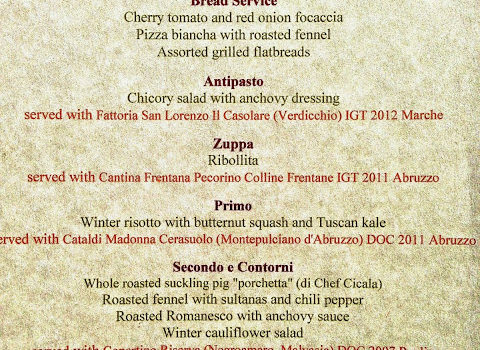 Missing, but vital, to the dish, is the prosecco (use dry white wine if you haven’t got prosecco), as well as butter and extra virgin olive oil. 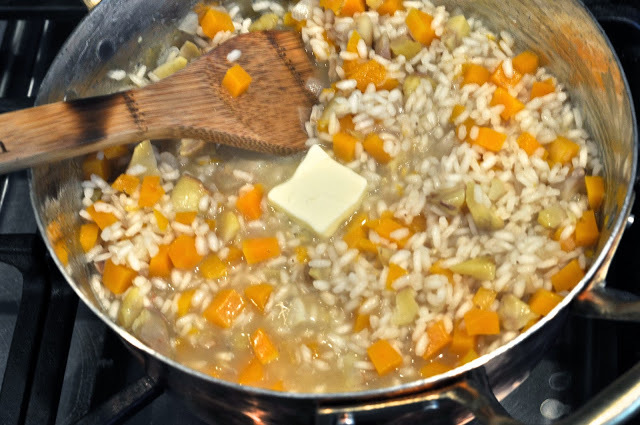 Dice the squash into small pieces because the squash needs to be small enough to cook while you’re stirring it into the risotto. That should take only about 20 minutes. Make sure you make a little extra risotto, because my next post is a truly irresistible treat using leftover risotto. 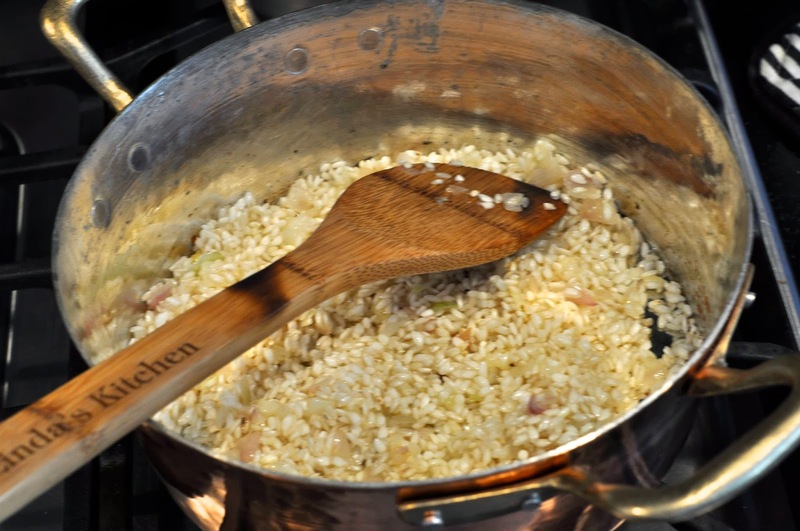 First thing you do is soften the shallots in a mixture of butter and olive oil, then stir the grains of risotto about for a bit — a process called “tostatura.” You don’t want the grains to turn brown, so just quickly heat the exterior for three or four minutes or until the grains are opaque. This will allow the rice to soak up the liquids without becoming soggy. 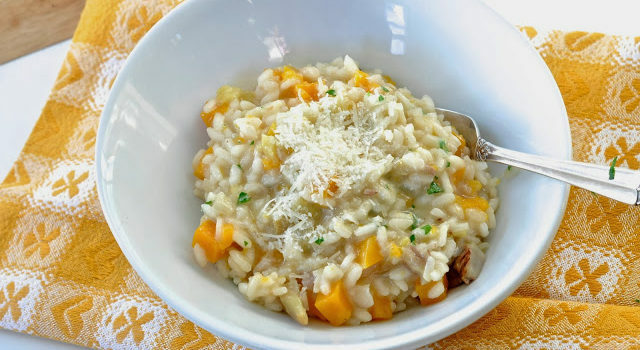 By the way, make sure to use carnaroli, vialone nano or arborio rice, short grain varieties that release a lot of starch, adding a creaminess to the dish. Then it’s time for the prosecco (or dry white wine). Don’t forget the cook needs a sample! and the parmesan cheese. Dig in. 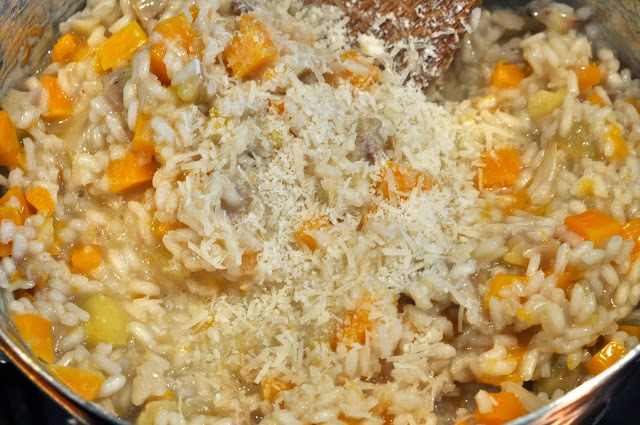 Place the olive oil and butter in a saucepan and add the rice. 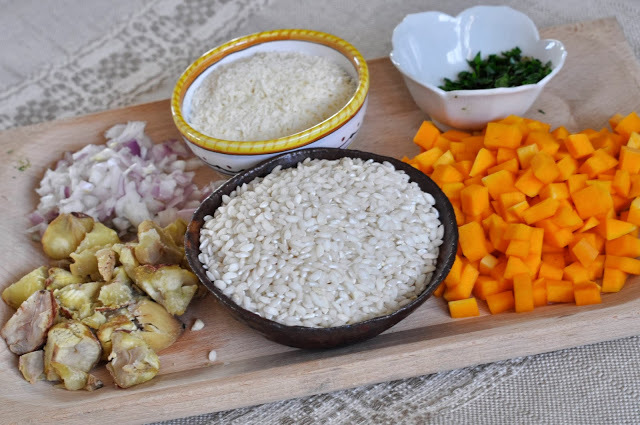 Toss the rice for a few minutes to coat, but don’t let the grains brown. 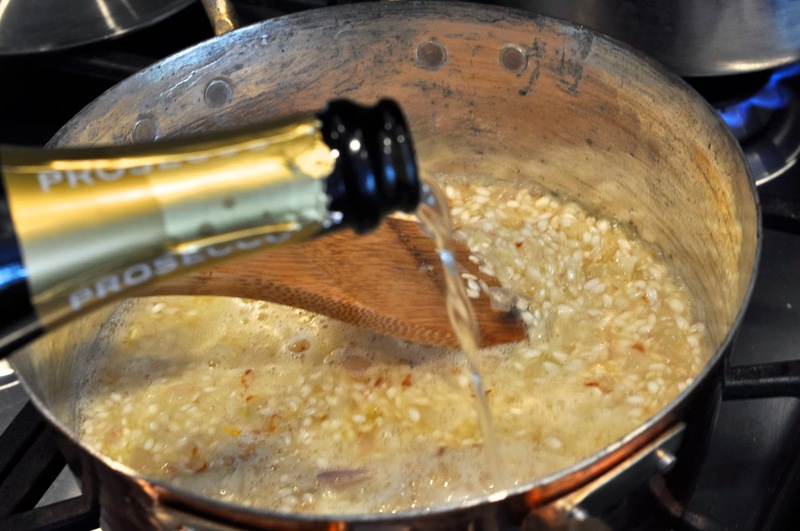 Pour in the prosecco and stir, then add the squash and chestnuts and a ladleful of the broth. 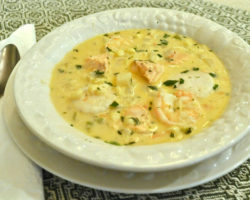 Continue stirring and continue adding broth, one ladle at a time, until the rice is cooked and tender to the bite. Season with salt and white pepper. Remove from the heat and add the cold butter and parmesan cheese. Still looking for Thanksgiving side dish ideas? 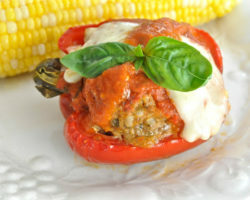 Here’s one that won’t take more than five minutes to prepare and tastes great. No peeling involved – you can eat the skin on acorn squash. 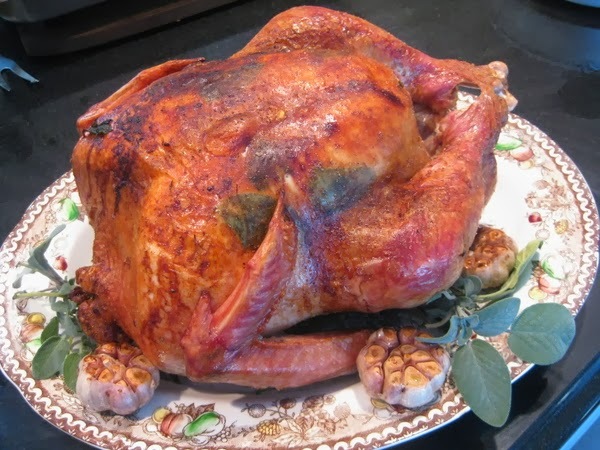 If you’re looking for a primer on how to brine and cook a turkey, click here to see how I do it. Wash the squash, cut in half lengthwise, then remove the seeds and cut into slices about 1/2 inch thick. Smear with a little melted butter on both sides, then sprinkle each side with salt and pepper, and a mixture of equal parts bread crumbs and parmesan cheese. Bake at 400 degrees for 30 to 40 minutes or until you can easily pierce the flesh with a fork. 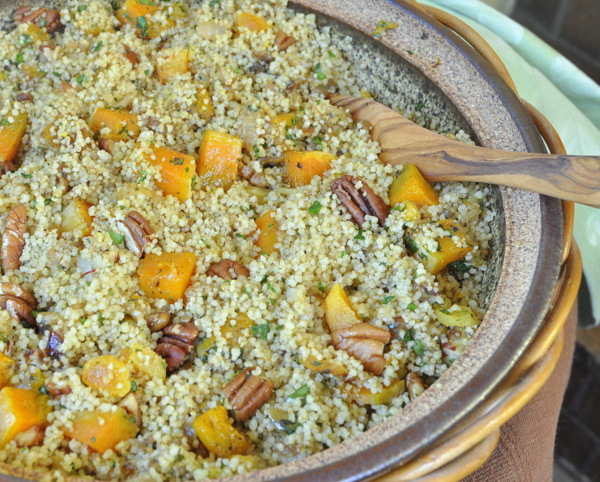 OK, you may be wondering “What’s The Columbian Exchange?” And what’s it got to do with this recipe of couscous and butternut squash? 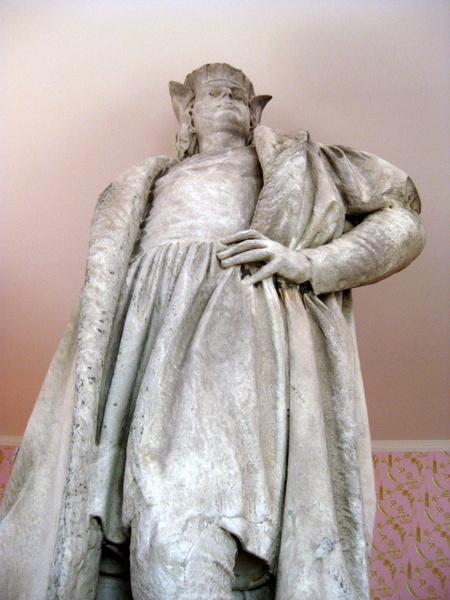 Well, for those of you in the U.S., it’s Columbus Day today. Now I know there’s a huge controversy surrounding the Italian explorer’s trips to the Western hemisphere and the “discovery” of America. 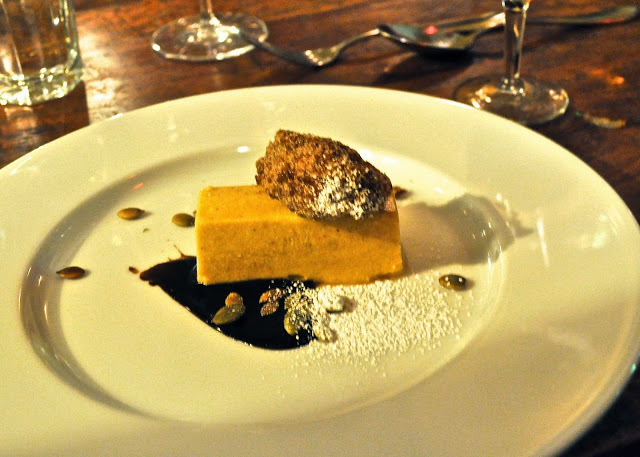 But this is a blog about food and travel, so I steer clear of geopolitics here. What I will tell you though, is that his travels to the New World starting in 1492 opened the gateway to exchange between Europe and the Americas — some good, like foods, crops and livestock — and some not so good, like communicable diseases and slavery. We’ll stick to the food exchange on this post. 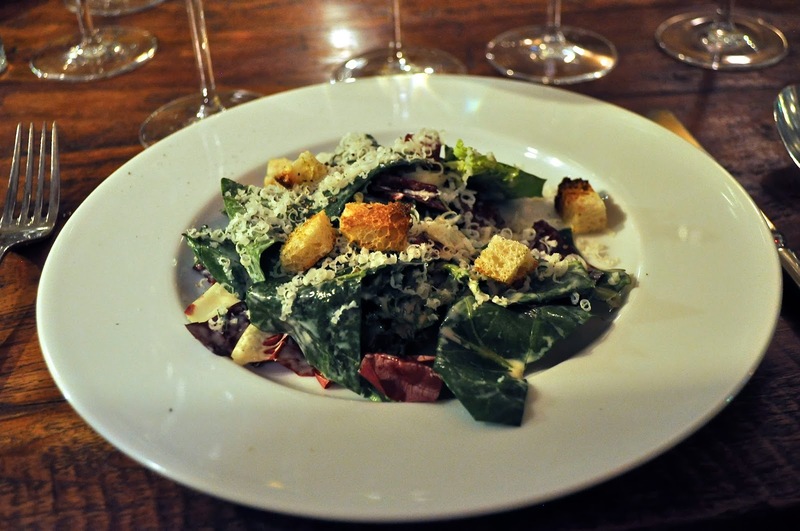 Can you imagine Italy without tomatoes; Ireland without potatoes or Switzerland without chocolate? No, me either. But the Columbian Exchange, as it has come to be known, introduced those foods to other lands that hundreds of years later have nearly become icons of those nations’ cuisine. In addition to the above examples, for instance, you can thank the Columbian exchange for oranges in Florida and bananas in Ecuador. 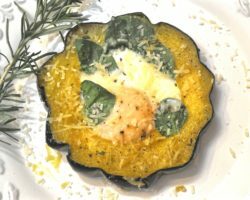 Squash made its way from the New World to Europe, which is why I thought this recipe would be perfect to present for Columbus Day. It combines flavors from the west (squash) with spices from the East (cinnamon, saffron). 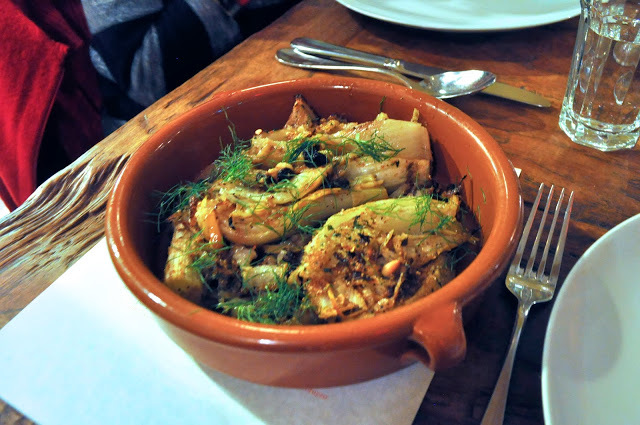 It’s also a recipe from Yotam Ottolenghi, an Israeli-born chef whose recipes are enjoyed around the world. Columbus might have missed his goal of finding a sea route to Asia, but his travels kicked off an international exchange that was to alter world cuisine forever. 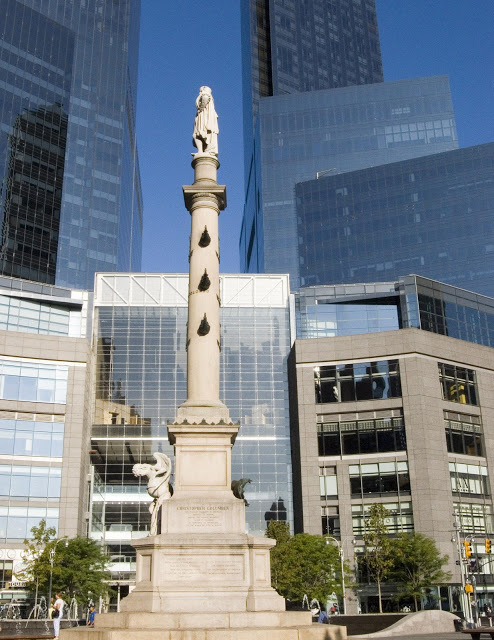 For those of you living anywhere near New York City, the statue in Columbus Circle pays tribute to the sailor from Genoa. It has stood on a granite column about 70 feet off the ground since 1892, visible to cars and passersby in this busy neighborhood of Manhattan next to the Time-Warner Center. 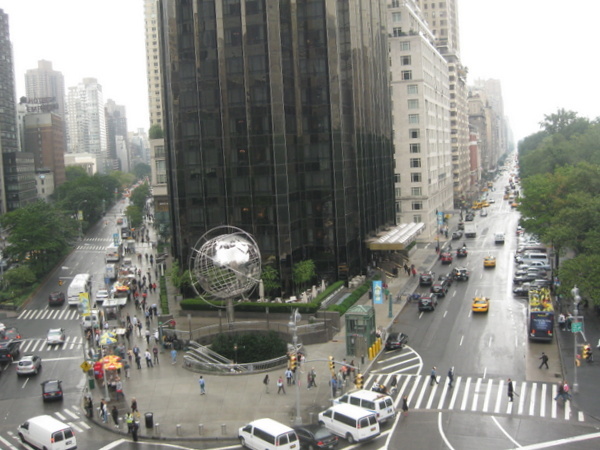 But if you travel to Columbus Circle now, you won’t see the statue from the street. 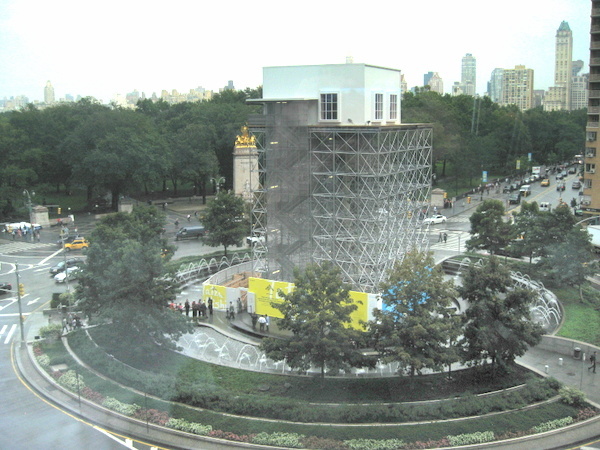 Instead, climb six stories of stairs, amid scaffolding, and witness Columbus close up in a conceptual art installation by the Japanese artist, Tatzu Nishi. Until Nov. 18, he’s the centerpiece of what looks like a living room in a New York City apartment. 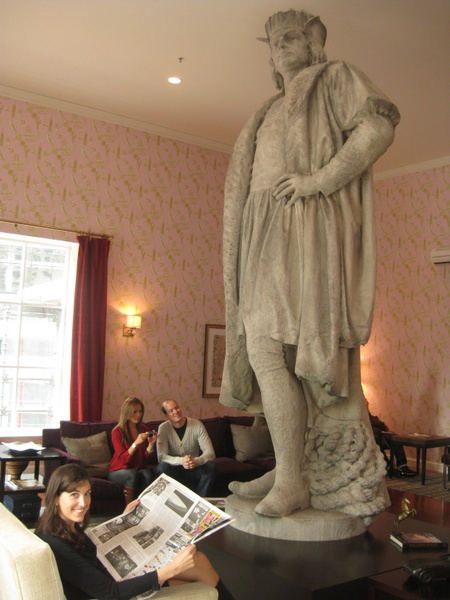 Here’s the big guy himself – all 13 feet of marble. Until now, only the birds had such an intimate view. His feet appear to be resting on a coffee table, surrounded by magazines and newspapers. Have a seat and catch up with the news while Christopher surveys the living room. 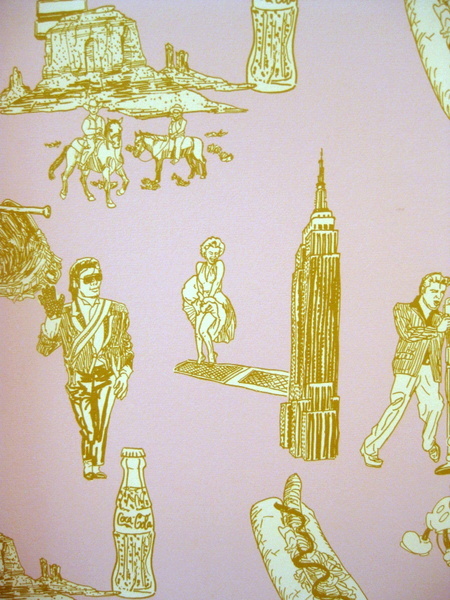 The apartment’s wallpaper is designed with iconic American scenes. Want to watch a little TV or read a book? No problem. You’ll have a great view of the Trump Tower apartment building across the street. 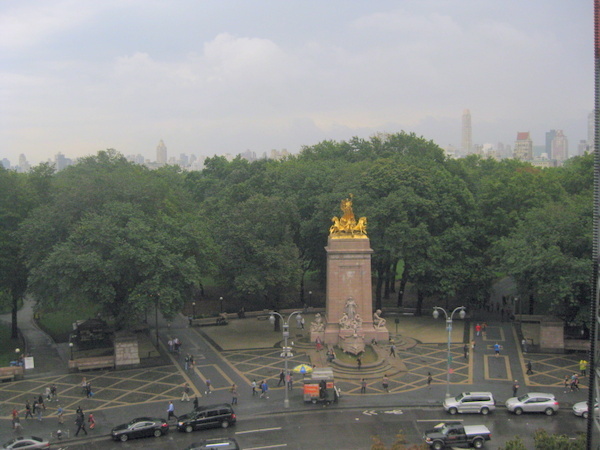 While you’re there, savor the view of Central Park from your perch in the sky with Columbus. Then come home and make this vegetarian dish of couscous with butternut squash and apricots from Ottolenghi – a legacy, if you will, from Columbus. If you’re in New York and want to visit, you’ll need a ticket. It’s free. 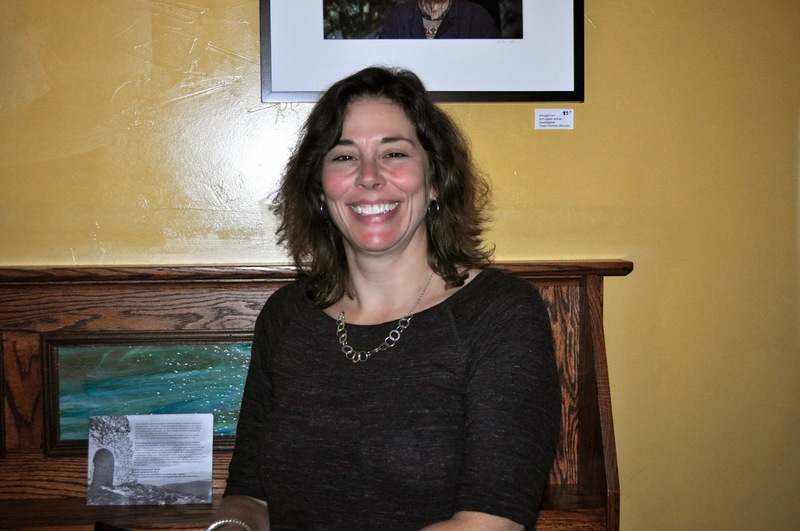 Click here to find out more about the artist and the art installation. 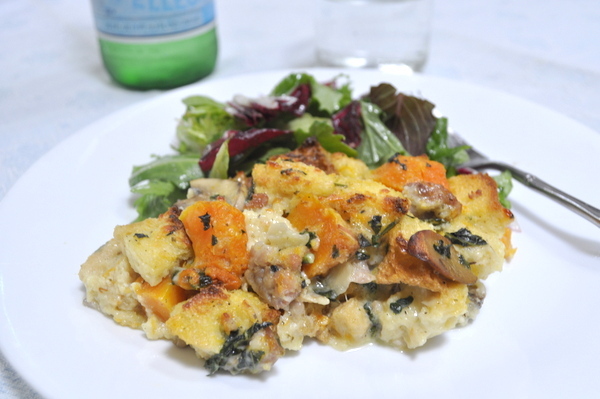 (I increased the ingredients by half and made 1 1/2 times the recipe and it served way more than six as a side dish. I would count on at least six servings or more from the base recipe. 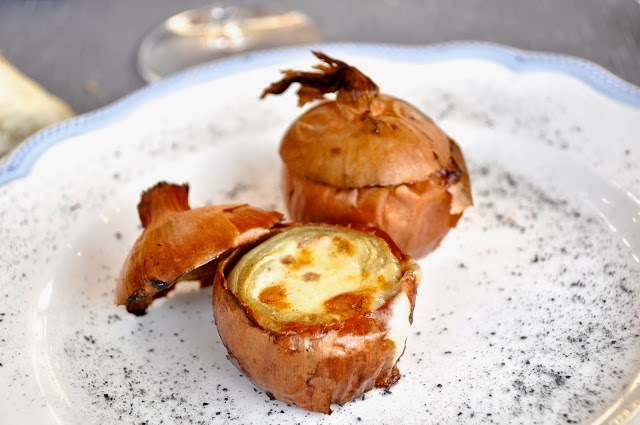 Place onion in a large frying pan with 2 tbs oil and a pinch of salt. Sauté over high heat, stirring constantly for about 10 mins (I used less time), until golden brown. Set aside. Pour hot water from the tap over the apricots just to cover them. Soak for 5 mins then drain and cut them into 5mm dice. 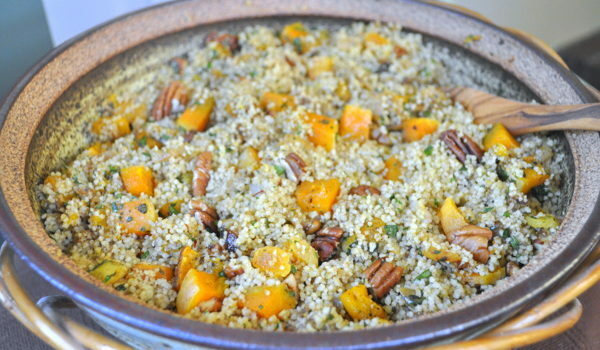 While waiting for the butternut squash to cook, cook the couscous. Bring the stock to the boil with the saffron. 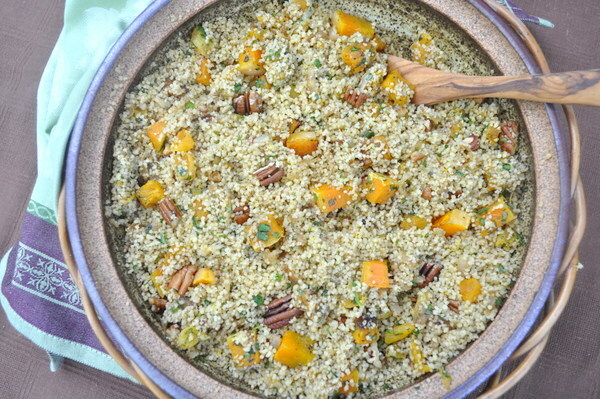 Place the couscous in a large heatproof bowl and pour the boiling stock over it, plus the remaining olive oil (3 tbs). 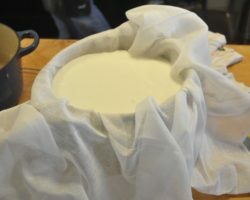 Cover with clingfilm and leave for about 10 mins for all of the liquid to be absorbed. When done, fluff with up with a fork. 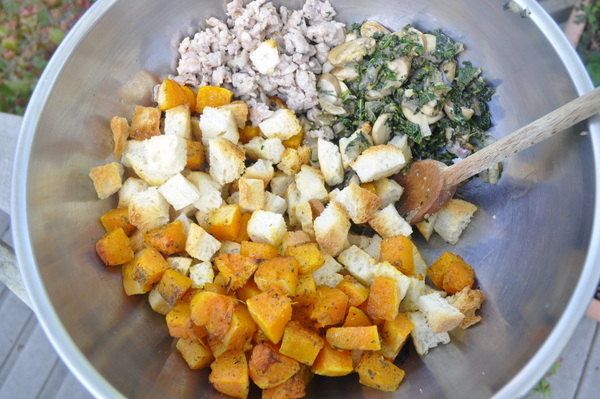 Then add the onions, squash, apricots, herbs, cinnamon and lemon zest. Mix well with hands, trying not to mash the squash to bits. Taste and add salt and pepper if necessary. Serve warmish or cold.